New Hampshire is the latest state to be targeted by the campaign to turn America's workers into low-wage serfs. A state representative from New Hampshire's wealthiest town will propose a "Right to work (for LESS)" law in the state legislature, The Portsmouth Herald reported last week. R-i-i-i-ight. Smith is a former CEO so you know where he's coming from. Politicians all over the country are filing right-to-work (for LESS) laws as political payback to their corporate backers. But New Hampshire is a little different. The state's Great and General Court (that's what they call their legislature) has 424 members who get paid $100 a year. They generally don't rely on big corporate donors to get elected. Most of them are well-meaning amateurs, known and liked in their town or neighborhood. But that doesn't mean New Hampshire lawmakers are immune from the propaganda put out by the well-funded and well-organized conspiracy to destroy America's middle class. The president of New Hampshire's firefighters union explained to the Herald that elected officials get inundated with mail from the National Right to Work Legal Defense Foundation. The only thing the NRWLDF is defending is billionaires' wealth. The NRWLDF is at the nexus of the plutocrats' anti-worker campaign. Hundreds of millions of dollars slosh around an interlocking network of think tanks and boards that come up with misleading arguments for suppressing wages. 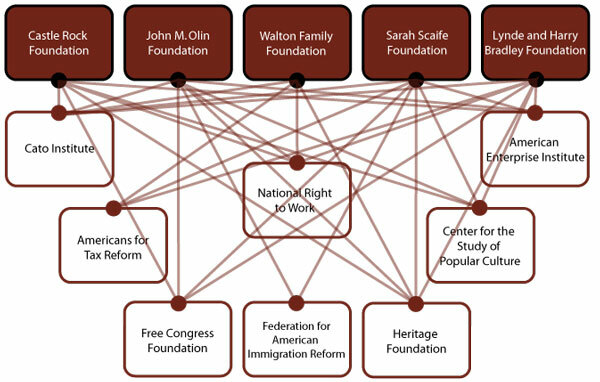 Here is a somewhat dated chart created by American Rights at Work to demonstrate the web of funding behind "right to work (for LESS) efforts. Though they consider themselves "philanthropic," many of these groups give money to each other. They excel at concepts like "free enterprise," "individual freedom" and "choice," designed to disguise their true purpose of enhancing corporate power. Some of them are big supporters of school choice, designed to bust teachers' unions. "Castle Rock Foundation" is run by the heirs to the Coors fortune. The John M. Olin Foundation was founded by the heir to a chemical and munitions fortune; it closed up shop after giving $370 million to increase corporate power. The Walton Family Foundation was founded by Wal-Mart heirs. The Sarah Scaife Foundation by a Mellon banking heir. The Lynde and Harry Bradley Foundation, which resulted from sale of the Allen-Bradley Company, promotes "educational choice" and "free enterprise" (i.e., union-busting). One of the plutocrats left off the chart is billionare union-buster David Koch, the 49th richest man in the world. Koch supports the Cato Institute, Americans for Prosperity and the Reason Foundation. Last fall, Koch's "philanthropy" was exposed in The New Yorker magazine, and he was subsequently booed at the ballet in New York City. 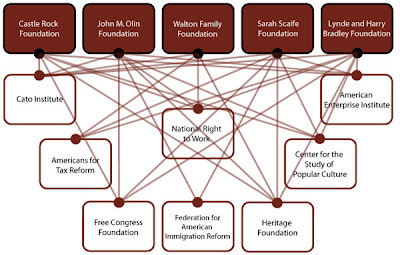 It's a mystery why these organizations get tax-exempt status for trying to lower workers' wages. 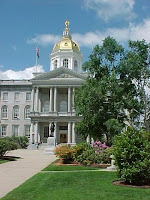 New Hampshire enjoys an economy that provides good jobs in strong industries. We do well in good times and bad. There is no good reason for us to experiment with an ideology that is proven to benefit a few at the expense of everyone. Solidarity from celebrities on Sun. Obama wants to open the border to this? Atlanta mayor on TV in Teamster jacket!